This is Upton’s second All-Star appearance after representing the D-backs in the 2009 game in St. Louis, while Montero is getting his first taste of All-Star festivities. The D-backs backstop was chosen to replace injured Phillies infielder Placido Polanco. Following Arizona’s game against St. Louis on Sunday, Montero was informed of the news by skipper Kirk Gibson. Although he and his family had prior plans for this year’s All-Star break, the first-time All-Star didn’t mind having to reschedule. Montero was shocked upon hearing that he’d be at the Midsummer Classic. He immediately phoned his wife and flew his family in from Venezuela. The All-Star “rookie” even struggled to sleep on the flight back to Arizona. In his sixth big league season, Montero has been an offensive force in the heart of the D-backs’ lineup. The first half of the 2011 campaign saw him bat .272 with 10 long balls and 45 RBI. The Venezuelan slugger leads all Major League catchers with 22 doubles. He also leads all National League catchers in runs with 40. His 77 hits tie him for second among all NL backstops. Montero and his 45 RBI trail only Atlanta’s Brian McCann in RBI from an NL catcher. Montero’s strong offensive numbers certainly made a case for him to be included on the NL roster. 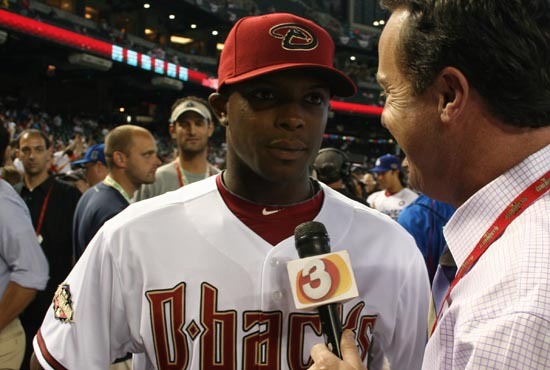 The D-backs’ other All-Star representative is none other than Justin Upton. After earning his first All-Star nod in 2009, the starting right fielder has enjoyed another breakout season in 2011. With power to all parts of the field and an ability to hit for average, Upton’s bat is capable of leading the D-backs’ offense for weeks at a time. In his fifth big league season, the right-handed hitter owns a .293 average with 15 homers and 46 RBI. Not only has he flashed power, but Upton is always a stolen base threat when on the base paths. He’s swiped 14 bags this year. Upton was nearly unstoppable in the month of June when he hit .382 with nine doubles and 15 RBI. He also posted an on-base percentage of .467. The former No. 1 overall pick’s successful first half made him an ideal All-Star candidate. For Upton, it’s a thrill to participate in a Midsummer Classic at home. On All-Star workout day, both teams participated in batting practice in front of thousands of fans at Chase Field. When Upton stepped into the cage for his turn, the crowd erupted. Both D-backs All-Stars have received plenty of support from the Chase Field crowd. Upton is more than willing to share the hometown love, as he’s just happy to share the experience with a teammate.